At twilight, a cannon shot screeches through the air. Police on horseback push back the thickening, excited crowds, clearing out the procession route. On the sidewalk, onlookers, who have been waiting for this moment since early morning, picnicking on plastic blankets to secure their coveted spots, suddenly stand up. They forget their shoes and food wrappers on the ground behind them as the sound of beating drums amplifies. A third cannon shot signals the elephants to begin their slow, consequential gait down Kandy’s uncommonly empty streets now glittering under thousands of tiny string lights. It is the final evening of the Randoli Perahera. At the same time, the Kandy Esala perahera is a mixture of histories and cultures, including Sinhalese traditions, Hindu culture, and even Thai influences brought over when the king of then Siam visited during the perahera with a contingent of Buddhist monks. These ethnic variances which make Kandy’s perahera so unique, also reflect the cultural shifts within Sri Lanka and how the perahera has changed with the country. In fact, the very practice of Kandy’s perahera is a combination of, primarily, two peraheras. 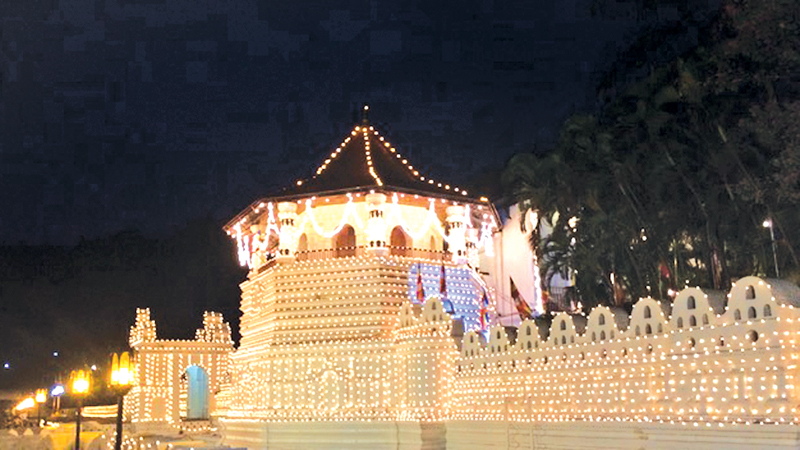 The Esala peraherapre-dated the arrival of the Sacred Tooth Relic in Kandy, when farmers paid homage to the gods for rainfall during the month of Esala on the Sinhala calendar. Later, after the Sacred Tooth Relic was brought to the city in the 16th century, the Esala perahera came to include the Dalada perahera. During the 18th century, the Sacred Tooth Relic was brought out of the Temple in its casket for all of Kandy to pay obeisance, simultaneously transforming the festival into a show of dancers, flame throwers, whip crackers, and tides of majestically dressed elephants. Legend has it that when this tradition started, the monsoons came on time. “The rains started flowing, the rivers filled up, and Sri Lanka became agriculturally self-sufficient,” said Rambukpotha. During colonial times, the British changed a key aspect of the perahera by creating the institution of a Diyawadana Nilame, the Lay Custodian of the Temple of the Tooth. The Lay Custodian is an honorary title that is given not to a monk or a king, but rather a member of the aristocracy. He is elected by the Buddhist clergy to help protect the Sacred Tooth Relic and organise Kandy’s annual perahera. Rambukpotha said that during the recent war, security was tightened more and more, until finally crowds diminished dramatically. “I’ve been watching this perahera since I was a child, in the 1960s, and I would say that there is a decline in the crowds, the number of people who watch the perahera today,” said Rambukpotha. He clarifies that this is his feeling and is not based on any formal research. He thinks the decline in crowds is particularly odd today, given the facilities that are available now. Despite the facilities, he says, the first five days of the perahera attract only small crowds. “In the ’60s and ’70s, people came without any facilities.” Rambukpotha remembers the crowds coming to watch the perahera, due, he speculates, to their faith-based enthusiasm for the festival. Who comes to Kandy’s perahera today? On the final two days of the perahera, there are many tourists from abroad, including Buddhist tourists from countries like Japan and Myanmar. “I like the festival, and also, we are Buddhists,” said Junesakai, a Japanese woman with her friends and relatives, who explained that they had come to the perahera, “not so much as a pilgrimage, but for something like religious tourism.” She remarked upon the fabulous dancing she saw and the wonder of the elephants. Junesakai said that there is nothing like the Kandy Esala perahera in Japan. Others, like a group of three young women from England and Scotland, came to be at the perahera serendipitously: “We didn’t know about the perahera, we just stumbled upon it. It’s cool! Amazing,” they said. Today, one of the challenges that the Diyawadana Nilame (Lay Custodian) Pradeep Nilanga Dela faces is to make ancient rituals relevant. “We want to update our standards from the ancient times,” said the Diyawadana Nilame. His private secretary also credits the Diyawadana Nilame with having streamlined the perahera’s logistics. Yet another way that the Diyawadana Nilame has sought to keep these ancient traditions within the modern context is by offering further education for the perahera’s dancers. “I have decided to start an academy for the dancers,” he says. The academy will reside within the Sri Lanka International Buddhist Academy in Pallekele. “In that academy we will offer diploma courses, then allow them to sit for the degree.” The Diyawadana Nilame guesses that at present only 10-15 percent of the dancers have formal degrees because traditionally, the dancers were part of a rigid caste system that steered them away from formal education. Another obstacle that today’s Diyawadana Nilame faces is confronting contemporary challenges to old traditions such as the use of elephants at the perahera. The Diyawadana Nilame is himself an elephant owner, and his personal experiences with elephants makes him extremely sceptical of the contemporary criticisms launched at the ritual. “Now Western countries are criticising us about the treatment of elephants. But a lot of NGOs are making money off this issue,” he said. The Diyawadana Nilame also argued that British colonisers came to Sri Lanka and hunted elephants. Instead, he laments, “We need more elephants.” Even though, of the less than 100 elephants in captivity in Sri Lanka, every year about 80 percent are used in the Kandy perahera. On the final evening of festivities, the Randoli perahera, a captive audience was packed person to person and pressed against the iron bars surrounding the Temple. Behind them, a white building sits unobtrusively over the Kandy Lake, where the queens of the Kandyan Kingdom once watched the perahera from their balcony. It is yet another example of how the perahera has historically adapted to the social context in which it exists. 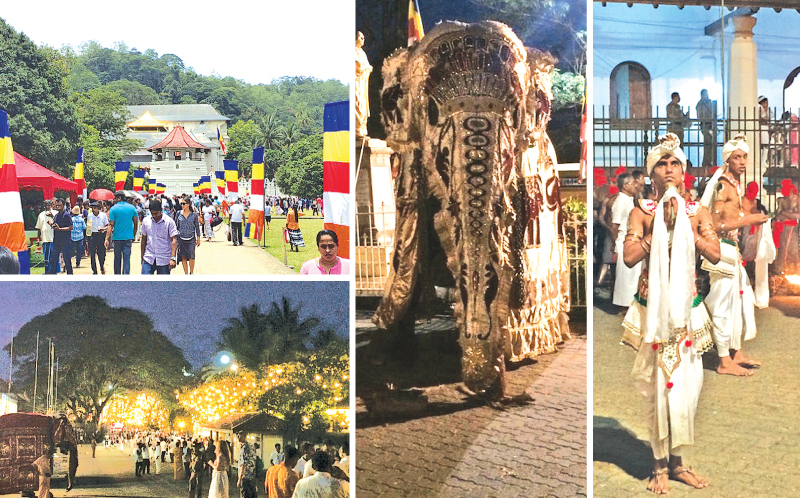 Despite its historicity and prominence, which makes the Kandy Esala perahera a singular event in the country, old traditions and culture tend to accommodate the present moment. As foreigners and Sri Lankan nationals alike pressed their faces between the bars of the Temple fence, waiting eagerly for the procession of elephants, dancers, and finally the Sacred Tooth Relic to come down the road, it seemed like another moment of transition was in store for the perahera.